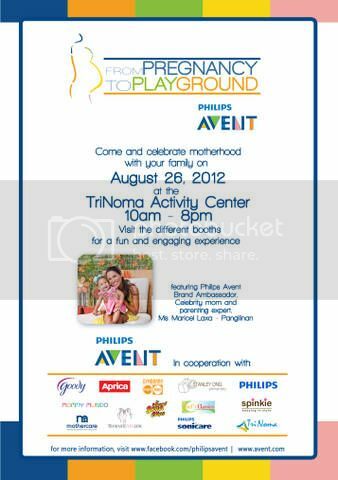 Everyone is invited to join Philips AVENT’s From Pregnancy to Playground which will be held at the TriNoma Activity Center from 10am to 8pm this Sunday, August 26, 2012. This event will feature a belly cast and pregnancy portrait exhibit, informative yet entertaining stage programs and pocket activities for moms and their families. The event area will be open at 10AM, while the program will start at 1PM. Philips AVENT brand ambassador Maricel Laxa-Pangilinan will also have a segment at around 5pm called “Ask Mommy Maricel” to answer questions about motherhood and parenting. This entry was posted in From Pregnancy to Playground, Philips AVENT. Bookmark the permalink.